Howards are proud to be a sponsor of the morning breakfast show on Tauntons 107.8 Tone FM, bringing local radio back to the local community! More & more people in the Taunton area are waking up to the sound of Tone FM and the voice of Terry Beale to prepare for the day ahead. 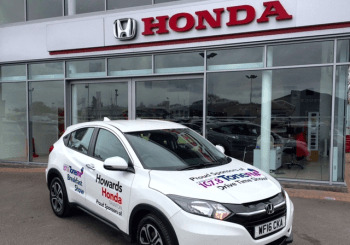 To show our dedication to Tone FM we have taken the new award-winning Honda HR-V shown in the images and dresses it with custom-made Tone FM Livery to support the Breakfast Show. At Howards we pride ourselves on working closely with local communities we operate in and are always looking for new ways to show our support. We like to go that extra mile for our customers, in doing so we now provide this brand new Honda H-RV to any customers leaving their Honda for a service at Howards Honda Taunton. Take advantage of our drop-off and collection service in and out of town, we are making it convenient for you to keep your Honda’s service book up to date. The new Honda HR-V has recently picked up the prestigious ‘New Car of The Year Award’ at the AM Awards in February. This spacious SUV is the right car for any family, as it provides a cavernous luggage area at 453 litre which can expand to 1026 litres when you lay the rear seats flat. Now that’s some boot space! Find the latest goings on in the local Taunton area on Tone FM’s website and be sure to give them a like or follow on Facebook, Twitter and YouTube!